Once again, Lehman has chosen Victory Motorcycles’ Vision model as the soul of the unit, a behemoth motorcycle with some curvaceous styling, and they’re calling it the Cimarron. First the specs, and then we’ll discuss why it’s sort of an odd name. The Cimarron features a two-tone paint scheme that complements the aforementioned curvaceous styling. What’s more, it comes standard with a reverse gear and John Lehman Signature billet wheels. It is available now. So Texas annexed what was next referred to as Cimarron Territory. The territory languished for awhile before it was eventually combined with two other areas to form the state of Oklahoma in 1907, and ever since then, children have asked teachers why Oklahoma has that strange appendage. Rest assured, we’ll be doing some digging as to how Lehman arrived at “Cimarron” as the name for its latest offering. This entry was posted in OEM and tagged Cimarron, Lehman Trikes, Victory, Victory Vision. Bookmark the permalink. 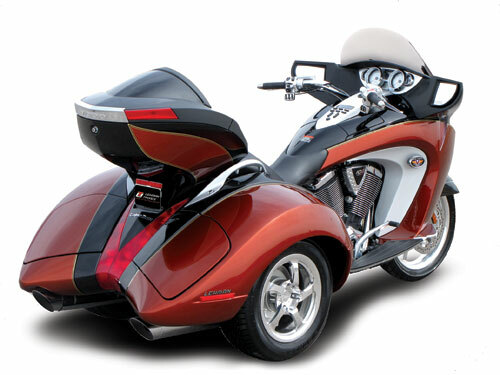 Love the Vision Trike, and especially the new paint scheme! A little too pricey for me at this time, but I’m hopeful that’ll change if you produce a CrossCountry Trike. Told my local Victory dealer I’d trade in my Vision when they get one! Keep up the great ideas … I’m waiting !